The Swedish Forestry Association (Föreningen Skogen) has 8,000 members who are all passionate about improving our forests and forestry. Most members are forestry officials, private forest owners, employees within forestry equipment companies or forestry workers. They belong to the Association on an entirely non-profit basis. For more than 130 years, the Association has had a decisive role in the transformation of a landscape that had been devastated by reckless cutting into the valuable, vibrant forests of today. But there is a lot still left to do. We participate in development by providing information, further education, news services, debate and network building. Our activities include publication of the trade magazine of our sector, SKOGEN (The Forest), field trips, publishing, digital newsletters, consultation and meetings. At our annual congress, we pay tribute to people who have made a special contribution to forestry. This tradition began in the 1940s and the awards are presented by His Majesty the King of Sweden, patron of the Association. The Association also owns the forestry image bank SKOGENbild which, in addition to a historical archive, has around 20,000 pictures of great topicality and quality. The number of pictures is increasing all the time thanks to the work of the magazine’s editorial office and ten professional freelance photographers. We are deeply engaged in the communication between the forestry sector and the public. On a national level we coordinate the contacts with schools (Skogen i Skolan) and we run the web platform www.forestsweden.se (www.skogssverige.se) with facts and dayly news about forestry and the forest industry. Our question box by now has 7000 answered questions. 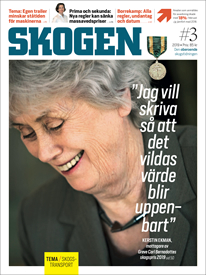 The head office in Stockholm has twelve employees and the Association derives its income from the membership fees from private individuals, as well as revenues from SKOGEN magazine, books and activities. The Association is free from political, economic and trade union connections. The Swedish Forestry Association was founded in 1882, at which time the vast majority of the country’s forests had been devastated by, milling, mining and grazing livestock. At an early stage, we sent out sowing instructors to rural areas, published instruction pamphlets, discussed silviculture on field trips, rewarded efforts to prevent forest fires, conducted the forest policy debate, gathered statistics and published the results of early forestry research. Over the years, the Swedish Forestry Association has been behind the start of forestry trade fairs and companies that supply forestry equipment. SKOGEN magazine was first published in 1914. Today, the Association’s publications provide the best review of developments in the industry over the last hundred years. International cooperation has always been an important element of our work. 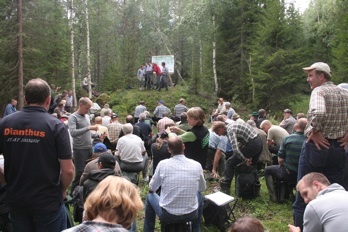 Together with our sister organisations in neighbouring countries, the Association is a party to the Nordic Forestry Union, and early in the 1990s the European Forest Network was founded, EFN.